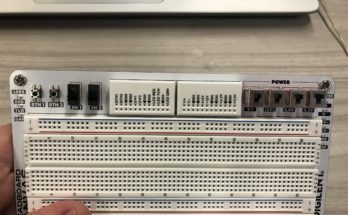 You may have noticed that both the Analog Discovery 2 and the Digital Discovery have a Logic Analyzer. They also use the same software, WaveForms 2015, so the interface is the same. This may beg the question… what exactly is the difference between the two? Since the interface is the same, the main difference to the end user ends up being the specifications, and the pinout. 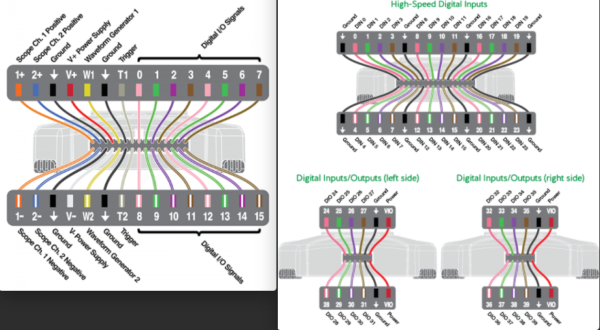 The Analog Discovery 2 pinout is on the left and the Digital Discovery pinout is on the right. You may have also noticed that both the Analog Discovery 2 and Digital Discovery are built off of the same Spartan 6 FPGA. Where the differences become apparent is in how the logic resources are used, and the peripheral hardware. 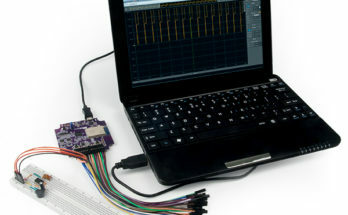 Instead of focusing resources on the analog functionality of the Analog Discovery 2, such as the Oscilloscope and Waveform Generator, the Digital Discovery focuses all resources on digital signal analysis. You can see this clearly in the comparison table. 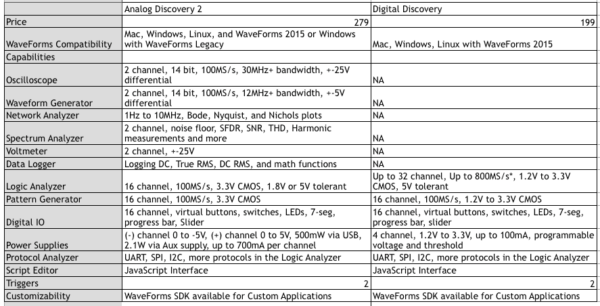 You can see that the sample rate of the Digital Discovery is dramatically higher than the Analog Discovery 2, and the maximum number of channels is double. Along with higher capabilities, the Digital Discovery Logic Analyzer is much more customizable. You can choose a logic level between 1.2V and 3.3V making the Digital Discovery compatible with more digital systems. The Digital IO are also 5V tolerant. The Power Supply interface allows you to configure the Digital Inputs and Outputs to match the logic level of your system. In addition to being able to choose the logic level, you can also choose sample rate and number of channels. With 32 channels the sample rate is 200MS/s, with 16 channels the sample rate is 400MS/s*, and with 8 channels the sample rate is 800MS/s*! From the Logic Analyzer tool you can select the sample rate and corresponding channels. With greater flexibility and higher spec, the Digital Discovery becomes the ultimate embedded development companion. To learn more about the Digital Discovery or Analog Discovery 2, check out their Wiki pages. *Note: In order to achieve sample rates higher than 200MS/s the High Speed Adapter and High Speed Logic Probes must be used. For more details, check out the resource center.